The Maryland State Crustacean is more than a creature with precision pinchers that cause pause about handling one for mere amusement. In fact, our most famous edible was a staple in the daily diet for Native Americans residing on the Delmarva Peninsula for centuries. The scavengers’ home is our beloved Chesapeake Bay, the largest estuary in the United States. The blue crab shares our bay with tourist and locals who fish, crab, swim, and sail in our path to the Atlantic Ocean. Commercially, the Chesapeake Bay is a leading national economic force averaging nearly one hundred million dollars in harvesting every year. Steaming crabs is a Maryland tradition, as well as other states on the East Coast. Our differentiator: flavoring with Old Bay Seasoning. Virtually every Maryland native will gather for countless celebrations simply to enjoy an evening feast of Old Bay steamed crabs and icy cold beer (typically accompanied by Eastern Shore grown Silver Queen corn on the cob). We take this tradition for granted from July through October, with the peak crab season in August. The meat of Maryland’s State Crustacean creates our famous year-long delicacy, the Maryland crab cake. This delicacy is copied throughout the nation, with few versions ever coming close to those locally prepared, with Observation Baltimore’s back fin lump version standing alone as the ultimate client favorite. 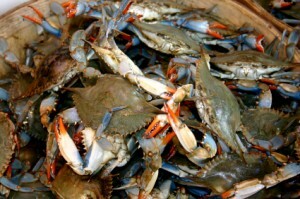 Other variations include soft crabs, which are caught just after molting, before the shell has time to harden. This crab is often sautéed, or battered with egg and flour and fried to a crispy crunch (eaten inclusive of the soft shell). The most creative of residents will transform the crown shell into artistic ornaments, sell them in waterfront retail stores, and decorate beach houses or who knows what else. There’s jewelry, tee-shirts, and virtually any merchandise paraphernalia that display our state’s famous crustacean. We feel the blue crab is not fully celebrated unless it is eaten. An acquired taste? We think not. Although lessons may be required for proper picking technique, along with patience, once experienced, we promise a pinnacle of satisfaction attained from the exquisite beautiful clump of white meat. Veteran pickers will hold it up high, with beginning pickers’ successes saluted. If you would enjoy an education, you may visit How to Pick a Crab. We love our Maryland Blue Crabs just like we love our field service division, Observation Baltimore. Contact Peter Scanlon (Peter@obaltimore.com) for a quote on your upcoming project! Observation Baltimore is a division of The Research Group. This entry was posted on Tuesday, May 27th, 2014 at 9:09 pm. Both comments and pings are currently closed.